Just because visual resumes are all the rage now, it doesn’t mean that the method is flawless. In fact, there are many things that can go wrong once you opt for showcasing your professional profile in this way. Here are five most common visual resume mistakes to watch out for when creating and sending out your crafted CV. This is a classic mistake made by many professionals who get carried away by their faith in visual resumes. Sending out only those innovative resumes can seriously damage your chances at employment – many companies and recruiters like to use an ATS or CRM system to process applications. Any kind of non-standard format won’t be read by the majority of ATS/CRMs and, consequently, recruiters could miss your resume in their searches. An impressive infographic resume might be the road to success, but if nobody finds it, it’s just as good as nothing. Sending both regular text and visual resume, you’ll make sure your profile won’t be lost. 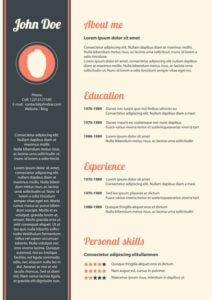 One of the most popular visual resume forms are video resumes. Sadly, most candidates fail to fully embrace their potential and produce videos that are simply boring. Videos offer a great opportunity to actually showcase your personality – instead of talking about it, it’s much better to include video testimonials from employers and colleagues or get creative and show the things you do well right in front of the camera. Online resumes – be it LinkedIn profiles or others – are great, but they’re not everything. A traditional word document is a must – again for that ATS/CRM reason. Why risk your resume to be ignored because it’s impossible to save it and print it out? Attaching a resume is also much more polite than asking someone to follow a link. It’s not likely that recruiters will take the effort to convert your online resume into a document that’s readable by their database. Since they won’t lose time reaching out to you to ask for a word version of your resume either, it’s just better to make their lives easier by attaching this document in your application. Even though visual resumes are ultimately about the look, it doesn’t mean content isn’t important. Some candidates who choose to create resume infographics make a huge mistake by focusing exclusively on their visual value, adding very little actual information. While this strategy might work if what you’re after are creative positions like graphic designer, it won’t bring much good for regular professionals. In short, always pay attention into the kind of content you plan to include in your resume. Even if space is limited, choosing the right data will in itself bring value to your professional profile. Focusing on the graphic design and sophisticated visual elements of their resumes, candidates often forget about basic details like contact info. Yes, it actually happens. Even if the resume has a perfect organization, it’s readable and paints a very interesting picture of a professional, a recruiter who isn’t presented with clear contact data might easily lose all hope for this candidate. An e-mail and phone number are a must for every kind of resume – be it traditional or visual. When it comes to infographic resumes, one of the most common mistakes made by professionals beginning to use this innovative medium is the complex issue of readability. It starts with cluttered layout, unprofessional and unclear look and dark backgrounds with lettering that is completely unreadable. Before jumping into the world of visual resumes make sure that someone else has a look at it to tell you whether the design is clear and professionally-looking. Visual resume isn’t a foolproof technique for catching the eye of recruiters – if you get it right, however, you really stand a chance at landing some very exciting opportunities. Amelia Dermott is an author on Gumtree Australia. She specializes in career development, workplace productivity and small business advice. She’s interested in entrepreneurship and photography.